My first serious introduction to astronomy came in 1970. A neighbor had one of the Orange C-8s and I first saw Saturn and its rings. The sky was a deep azure that I have never seen since. Saturn looked like a little jewel that you would swear you could put your hand out and pluck out of the sky. 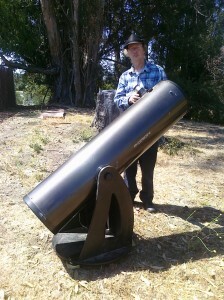 In 1972 I got my first telescope (a Sears $30 special) for Christmas. It wasnâ€™t up to anything really serious but I got my introduction to the Moon and Jupiter. My mom got a good laugh when I got my first good look at the moon and exclaimed that â€œWow-It really is roundâ€. I made up my own names for the area around the Apollo 11 LZ. I call the straight between the Sea of Nectar and The Sea of Tranquility the â€œStraights of Apolloâ€ and the area between Moltke and the highlands the â€œArmstrong Passageâ€. After taking astronomy under Dr. John Bowen at Cuesta College in the late 1970s I decided to try my hand at making my own 6â€ Newt from a set of plans for an inverted fork equatorial from Astronomy Magazine. I wasnâ€™t up to making my own mirror but everything else except for the secondary and spider I made from hardware store parts- such as an eyepiece holder made from a pipe flange and a sink drain. I couldnâ€™t figure out how to properly secure the tube assembly and ended up using ropes to secure the tube to the platform. This was my first serious scope and I learned the Messier Catalog and began to follow some variable stars that Dr. Bowen had introduced me to in his class such as R CrB and R Leo (both of which I still follow). I also got to see my first Saturn Ring Plane Crossing in 1980. This one was actually a triple-crossing although I only remember seeing two of them. I also got interested in Eps Aur during its 1982 eclipse but my observations have unfortunately not survived. After attending a couple of the CCAS monthly events I joined in the fall of 2009 so as of this writing I am completing my â€œRookieâ€ year. I have found our monthly star parties at Star Hill the highlight of the month and have begun to schedule my camping trips to avoid missing these. Dark Skies and Good Hunting!